There’s a war on, and while this over-the-top water blaster is certainly an escalation in the Water Wars arms race, that’s not the war we’re referring to. We’re talking about the Documentation War. Hackers, you’re on notice. If you want to see how a project should be documented, look no further than [Tim]’s forum posts over at WaterWar.net. From the insanely detailed BOM with catalog numbers and links to supplier websites, to scads of build photos with part number callouts, to the finely detailed build instructions, [Tim] has raised the stakes for anyone that documents any kind of build. And that’s not even touching on the merits of the blaster itself, which has air and water tanks plumbed with every conceivable valve and fitting. There’s even an inline stream straightener made of bundled soda straws to keep the flow as laminar as possible. It looks like [Tim] and his colleagues are obsessed with launching streams of water as far as possible, and although bad weather has prevented an official measurement so far, from the video below it sure looks like he’s covering a huge distance with a stream that stays mostly intact to deliver the full blast to its intended target without losing a drop. For as much fun as amped-up water guns appear to be, we haven’t seen too many grace these pages before. Going way back we covered a DIY super-soaker. For something much less involved than [Tim’s] masterpiece, you can pull together this pressurized water pistol in an afternoon. [Shane] recently built an automated plant watering system for his home. We’ve seen several similar projects before, but none of them worked quite like this one. Shane’s system is not hooked into the house plumbing and it doesn’t use any off-the-shelf electronic valves. Instead, [Shane’s] build revolves around a device that looks like it was intended to spray weed killer. The unit works sort of like a Super Soaker. The user fills the jug with water and then pumps a handle multiple times to build up some pressure inside the jug. Then a button can be pressed and the air pressure forces water out of the nozzle. [Shane] came up with a way to automate all of these mechanical motions. First [Shane] had to find a way to pump up the bottle. He purchased a car door electronic lock actuator from eBay. It’s a pretty simple device. It’s just a DC motor with a gear box that turns the rotational motion of the motor into linear motion. This is mounted to a wooden jig and attached to the pump. A dsPIC microcontroller rotates the motor back and forth, which in turn pumps up the bottle. As with Jabba the Hutt we’d like to have our own service droid to serve up a cold one. 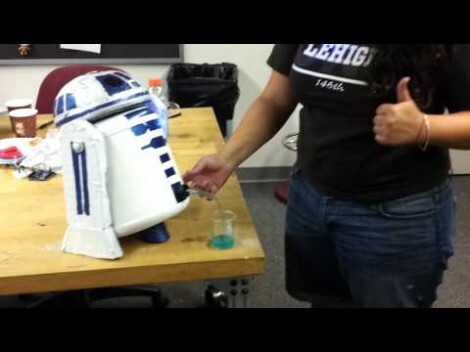 We’re in luck; it looks like you can make your very own beverage dispensing droid if you don’t mind a little awkward dispensation. The body started as one of those big protein drink mix containers. After spraying it white and masking off the entire thing with blue painter’s tape, the shapes for the blue designs were cut out and painted. Half of a foam sphere from the hobby shop was used to form the dome. With summer just around the corner you should try out a build like this constant pressure water gun that [JLspacemarine] put together. Similar to the commercially available Super Soaker toys, this isn’t just a squirt gun but includes a water reservoir as well as a pressurized air chamber. Pumping up the air chamber allows for a constant stream when the trigger is depressed. [JLspacemarine] used a combination of hardware store items such as PVC, ABS, springs, hose clamps, and valves to bring this all together.